I can’t believe it’s already been five years since I shared this house! After all that time it has still remained one of my all-time favorites. 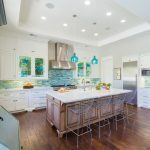 So when I was looking around HGTV’s website and ran into more photos of it, I knew I’d have to share! The incredible French island cottage designed by Barry Dixon and photographed by Edward Addeo is perched on a mountaintop on the island of St. Barts. It’s the dining porch and gazebo that make this so memorable to me…what dreamy ways to take in that jaw-dropping view! (Not that the infinity pool is half bad either!) 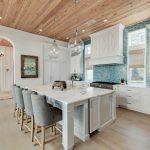 Love the breezy interiors as well, especially the turquoise kitchen inspired by the ocean outside! 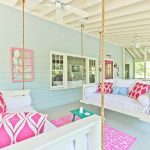 If you want to see more photos, Coastal Living featured the home too! Ohhh..i would love to stay on summer vacantion here!!! You find the most beautiful interiors (and exteriors). Love the porch especially. Erin, you are just knocking it out of the park the past few months with some of the most incredible turquoise decor i have ever seen!! Just keeps getting better and better! 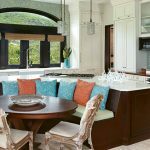 I have a question about a fabric used in the living area next to the kitchen in the St. Bart House featured in the Coastal Living Feb. 2011 issue. 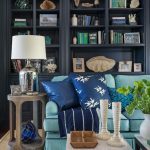 I am trying to find who make the aqua print fabric pillow on the sofa. I know the draperies and other pillows are made by Quadrille.